This disc is entitled Lutosławski: Complete Piano Works, but it would be more precisely named Complete Surviving Works for One Piano. 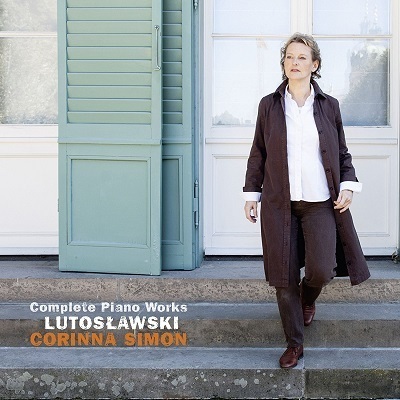 Lutosławski’s most famous piano piece is, of course, the Paganini Variations for piano duo, not included here, although pianist Corinna Simon does perform a short four-hand work, Zasłyszana melodyjka, all four of the hands her own in a studio overdub. Almost all of Lutosławski’s piano works are early, the short Inwencja dates from 1968, but everything else from the period 1934–1957. Lutosławski excelled as a pianist in his early years, and his compositional output, from his student days onwards, focused heavily on the piano. But much of this was lost when the composer left Warsaw shortly before the Uprising in 1944. Of the present program, only the Two Studies for Piano (1941) and the substantial Sonata (1934) are from an earlier era. The Piano Sonata was written while Lutosławski was still a student, and was apparently something of a calling card, with the composer performing it regularly, although he later distanced himself from the work and never sought publication. It is substantial, coming in at almost half an hour, and tightly argued, especially the first movement, which lands running, the main ideas presented up-front without an introduction and then rigorously developed. The style suggests Szymanowski, and perhaps also Debussy and some of the Russian late-Romantics. Connections with mature Lutosławski are more difficult to pin down, certainly the fluency of line and keen ear for appropriate and well-voiced harmony—matters of technique and compositional craft, then, more than of style or intent. The sonata ends the program, and the works the preceded it are all short. The Bukoliki (Shepherd Songs, 1952) and Folk Melodies (1945) are both reminiscent of Bartók in their uncomplicated but often innovative and angular piano settings of folk themes. The other works are in a similar vein, if not as explicitly folk-orientated. In terms of technique, the first of the Two Studies for Piano (1945) sounds like an imposing challenge for the pianist, as, inexplicably, does the first of the Pieces for the Young (1953). Corinna Simon gives engaging and characterful accounts of all the music here. She is at her best in the sonata, where the breadth of the musical argument matches the commitment and emotional engagement of her playing. She also excels in the virtuoso movements mentioned above, and there is never any question of the music ever challenging her technique. But in the folk music arrangements, her touch is a little too even and legato. Many of these short movements pick out a staccato motif or accompanying line as the basis for the music’s character, and too often the touch here is overly rounded and delicate. There is also too much pedal in many of these movements, an impression not helped by the audible dampers strangling the note endings as the pedal rises. The recording was made in a church, the famous Jesus-Christus-Kirche in Berlin, and the acoustic also contributes to the rounded-out effect. But the audio quality is good—in fact the piano is a little too immediate, the brightness of the tone often overpowering at climaxes. All round, an interesting program, though, and a useful window on Lutosławski’s early career. Worth hearing, especially for the sonata. This review appears in Fanfare magazine, issue 40:5.